Defensive sport of Japanese origin that consists of neutralizing an armed or unarmed opponent by means of dodging, throwing and holding, using bare hands. 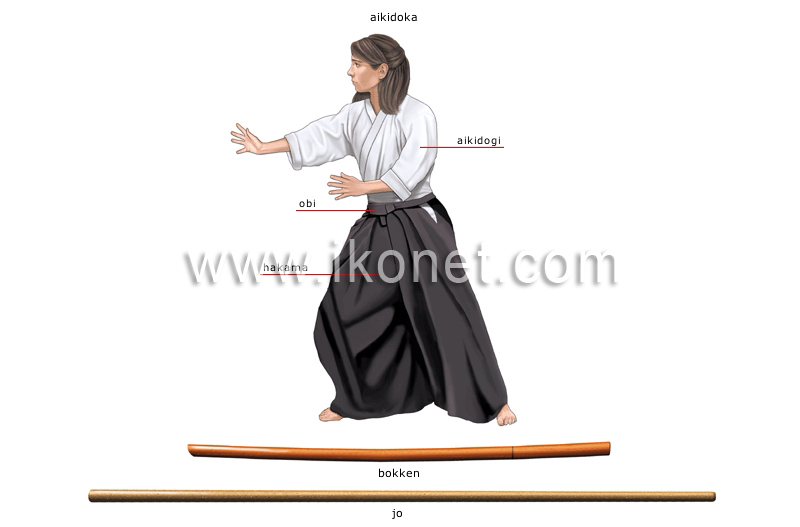 Wooden saber about 1 m long that is used for training; the jo and the bokken help develop the concepts of distance and position. Athlete who practices aikido; it requires good coordination, well-developed reflexes, suppleness and keen concentration. Long skirt for hiding foot movement. Long wide belt that is tied around the waist to close the jacket; its color indicates the aikidoka’s level. Clothing worn for practicing aikido; for beginners, it consists of a white jacket made of sturdy cloth and white pants. Wooden stick about 1.3 m long; it is used mainly for training.